From midcentury modern renovations to cutting-edge prefabs, the neighboring Napa and Sonoma Counties possess a wide range of homes in the modern tradition. 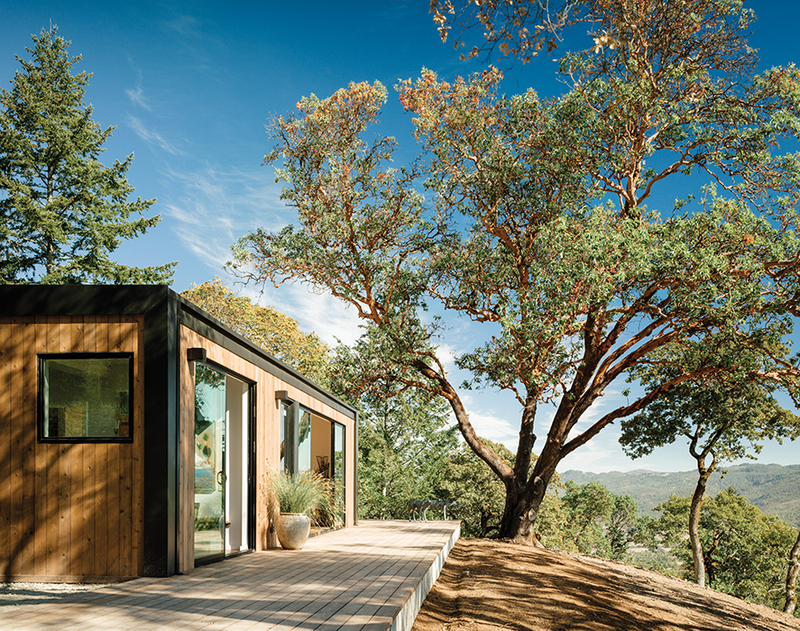 Thanks to a prefab in-law unit, an octogenarian modernist lives independently on a peaceful, verdant site in Sonoma, California. The 1,600-square-foot residence has two bedrooms and two baths for its 87-year-old resident, whose daughter lives nearby. In the Napa Valley, one sustainable residence elegantly demonstrates straw bale technology. Though visible elements of green design are found throughout the residence—from the recycled-glass and concrete countertops to the energy-efficient appliances—the straw bale that’s cleverly packed to make two-foot-thick walls is perhaps the architect's favored sustainable solution. Two designers restored this low-slung midcentury gem in Napa, California, by an unsung Bay Area modernist. One pours wine in the kitchen, which is defined by a low concrete-block wall and serves as the home’s central core. The seating-area chairs are from Herman Miller. To install the client’s prefab house, Stillwater Dwellings lifted the structure over an existing barn on the one-acre Napa property. The client, who is often on the road, also wired the house with the latest in smart technology. A new spin on rammed-earth construction aims to bring the method to the masses: David Easton, a pioneer in the field of rammed-earth construction, developed sturdy blocks made from recycled and waste material and then used them to build a Napa house for himself and his wife, Cynthia Wright, in collaboration with designer Juliet Hsu. Photo by Joe Fletcher .